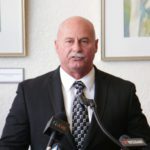 The chiefs of Fresno’s public safety departments predict dire results if voters pass Measure P.
“The biggest consequence to the citizens of Fresno if Measure P passes — they will have beautiful parks, but they will have deficient public safety services,” Fresno police chief Jerry Dyer said Thursday. The No on P campaign urged voters to reject Measure P at a Thursday (Oct. 18) news conference. The initiative would raise the sales tax 3/8 of a cent to benefit parks and related programs. Opponents want Fresnans to wait for a better tax measure in 2020. Measure P supporters say the tax is necessary to build new parks and rehabilitate the current ones. They vow to help support a public safety tax next. Both sides agree that citizens want parks, and the current budget levels don’t meet what is required to deliver them. The main sticking point is about priorities. Dyer said his department is operating at 200 fewer personnel than 2009, before the Great Recession. The list includes police officers, dispatchers, technicians, and community service officers. Fire Chief Kerri Donis said her staff is still operating at 1980 levels despite the massive growth of Fresno’s population and doubling of call volume. Both chiefs are dealing with aging equipment. Members of the business community joined Brand and the chiefs asking voters to wait for a combined tax. Brand said that a future public safety tax depends on Measure P’s failure. “It will be next to impossible to come back in 2020 and do two consecutive large sales tax increases,” Brand said. Fresno Chamber of Commerce CEO Nathan Ahle and Granville Homes President/CEO Darius Assemi seconded Brand’s thoughts. (Disclosure: Assemi is the publisher of GV Wire). At a Yes on P really last week, supporter David McDonald stated the measure would provide 42 uniformed police officers. Dyer said that comes with a big asterisk. Dyer noted that 75 officers are funded through outside resources, meaning their duties are specific. That includes 31 officers assigned to Fresno Unified and another 18 to FAX buses. The chief also expressed concerned that the language in Measure P calls for “park rangers” and said they would be for a limited period of time. Brand said he began negotiating with parks supporters back in January. “We tried extensively to find a compromise,” Brand said. The mayor pitched a tax plan providing a quarter-percent—covering 80 percent or about $24 million—for the parks’ needs annually. Brand also attempted to get a combined deal, a half-cent proposal (a quarter-cent each to public safety and parks) on the ballot separate of Measure P. But he did not get buy-in from the city council. The mayor withdrew the proposal before the council took a vote. A Measure P spokeswoman explained why parks boosters decided against a joint measure Thursday. “The volunteers and donors involved in the parks initiative were always willing to talk with our city leaders and try to find a mutually supportive path forward,” Yes on P’s Natasha Biasell told GV Wire via email. With no deal, parks supporters gathered 35,000 signatures by the July deadline in to force the council to put the item on the November ballot. If Measure P fails, Brand said he would talk to the leaders of the parks sales tax effort, but he plans to follow their methodology. All six candidates for three council seats up in November said they support both Measure P and a future public safety tax. Too Good to Be True? CO2 Could Be Fuel of the Future. What Mayor Brand, Police Chief Dyer and Fire Chief Donis do not appear to understand is that people want to have well-maintained parks in order to play soccer, basketball, and picnic. They also want to be safe in their communities. It is not an either-or situation. The people of Fresno want both. 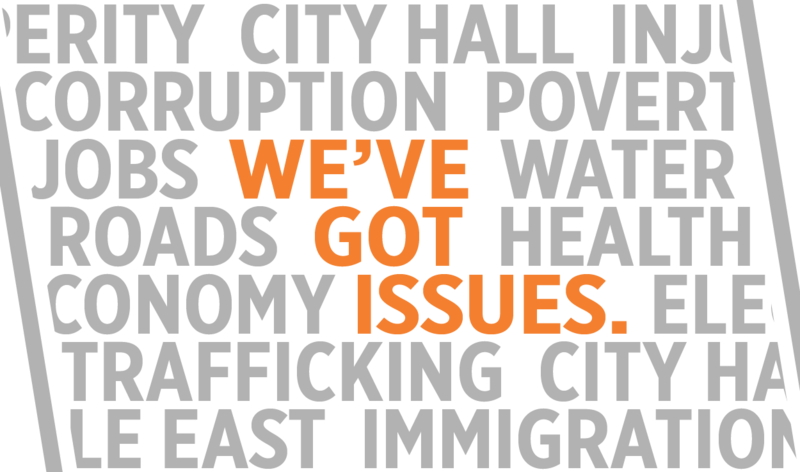 We will see if by voting for Measure P, the people show they are willing to pay higher taxes to have a better city. The problem that has to be overcome is that Fresno leaders like Mayor Brand, Councilmen Brandau, and Bredefeld, and Granville Homes President/CEO Darius Assemi (publisher of GV Wire) are so anti-tax they are only willing to pay for police and do not want to pay for parks, schools, roads or clean water. More police, by itself, does not make the city a better place to live or improve people’s lives. How about the fire department? So much focus on how the “No on P” campaign is all about law enforcement. Fresno has a tremendous fire problem with zero plans to make it any better. Mayor Brand had a comprehensive plan to support parks and public safety ( including the fire department ), however the “yes on p” folks would not work with the mayor’s well rounded coalition of city leaders, business leaders, employee groups and department heads. The Fresno Firefighters Associations recommends a no vote on measure P.
Unfortunately, the focus from many critics of the “No on P” campaign have centered around law enforcement. Where is the criticism of our City’s Firefighters? Yes, Fresno City Firefighters are encouraging voters to vote no on measure P. Why you ask? It’s simple; the Fresno Fire Department is woefully understaffed and underfunded. The City of Fresno has a major fire problem and it (the fire problem)for the most part as gone unaddressed. Mayor Brand is the first mayor to have the courage to bring forth a comprehensive plan to address the needs of not only the parks department by following the parks master plan that was approved by the City Council; but to also address the needs of law enforcement and fire protection. However, this plan was quickly rejecjed by those closest to Measure P.
Back to the fire problem in the City of Fresno. Our fire department has the same number of firefighters on duty per day as we did in 1980. Yes, 1980. And while we have individual Firefighters who will go to more than 1,000 working structure fires in a decade, I would challenge anyone to find an entire fire department let alone a single firefighter anywhere in California that has been to half that number of fires in the same timeframe. Why is this important? Well, because of availability. Our firefighters can only be in one place at a time. And, if we are that busy when you or a family member has an emergency we may not be around to respond because we are already at a fire across town. The 30 year tax (Measure P) does nothing to address this problem. What Measure P does do is equal parks spending to that of the fire department. In addition, measure P locks in parks spending to 2017 / 2018 levels. So, when the next recession comes, all future potential cuts will come from public safety and other essential city services. Not a good plan. The Fresno Firefighters encourage voters to vote no on measure P.